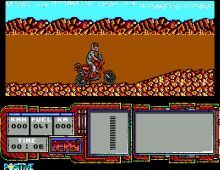 African Trail Simulator is decent mountain biking game with a simple premise: you take part in a desert rally against a specialist who will do anything he can to defeat you and prove that he is riding the best trail bike ever made. You can choose from 4 mountain bikes that range from 50 cc to 650, depending on your preferences on speed versus horsepower. Although the race itself is rather bland, with no regard to real-world physics or attractive scenery, it does offer a nice twist: before each leg of the race, you can take three of the five objects for use. The objects are first-aid kit, extra fuel, map, electronic compass, and pistol (useful for when your opponent has --erm-- evil intentions to kick you off the race). Choosing which objects to take depends on the characteristics of the route you are on: the map is useful in long, winding paths, while first-aid kit comes in handy in rugged terrain where you are sure to fall a lot. 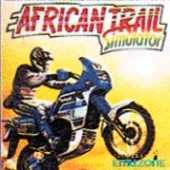 In the end, African Trail Simulator is a fun "light" action-oriented bike game that quickly becomes boring once you have played it once. And don't let the "simulator" in the title fool you-- reflexes are the only thing you'll need in this game.